BEIRUT — U.S.-backed forces in Syria announced the beginning Saturday of the possible final battle for the last village controlled by the Islamic State. In a brief statement posted on its website, the Syrian Democratic Forces said the push began Saturday night and was focused on the village of Baghuz, on the eastern bank of the Euphrates River in the southeastern Syrian province of Deir al-Zour. The statement gave no indication of how long it could take to capture Baghuz, but President Trump said on Wednesday that he had been told the full territorial conquest of the Islamic State could be completed in the coming week. That would herald an end to the more than 41/2 -year-long war aimed at pushing the Islamic State out of its self-proclaimed “caliphate,” the once-vast stretch of territory spanning Syria and Iraq that at its peak was roughly the size of Britain. Success against the Islamic State in Baghuz would also ­increase pressure on the U.S. military to pull out of Syria, in ­accordance with Trump’s instructions that the troops should leave once the Islamic State has been defeated. U.S. officials caution, however, that driving the Islamic State out of its territory would not end the threat it poses. The militants have been regrouping as an insurgency in many of the areas they have already lost. They could quickly rebound if the military victory is not accompanied by solutions to the grievances that contributed to their rise, the officials say. “ISIS remains an active insurgent group in both Iraq and Syria,” noted a report released Monday by the Pentagon’s Office of Inspector General. “If Sunni socio-economic, political, and sectarian grievances are not adequately addressed by the national and local governments of Iraq and Syria it is very likely that ISIS will have the opportunity to set conditions for future resurgence and territorial control. “Currently, ISIS is regenerating key functions and capabilities more quickly in Iraq than in Syria, but absent sustained [counterterrorism] pressure, ISIS could likely resurge in Syria within six to twelve months and regain limited territory,” the report added, quoting officials with the U.S. Central Command. In a reminder that the militants have the capability to mount attacks well beyond the front lines, assailants on motorcycles on Saturday tried to storm a base shared by the U.S. military and the SDF at the Omar oil field, around 60 miles north of the village where the militants are making their last stand. Most of the dozen or so attackers were killed and two managed to escape after a battle lasting several hours, during which U.S. airstrikes were called in, according to the Syrian Observatory for Human Rights monitoring group. The assault on Baghuz is being conducted by the SDF’s Kurdish and Arab fighters, backed by U.S. airstrikes and U.S. advisers. 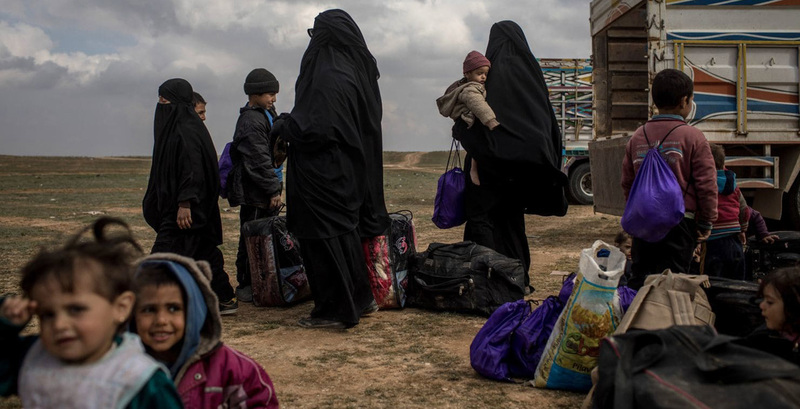 It comes after more than 20,000 civilians were allowed to flee the area over the past two weeks, many of them suspected fighters or the wives and children of fighters. They have been escorted to camps where they are screened for ties to the militants. Many of them are foreigners who can’t blend in with the locals to escape, according to SDF and U.S. officials. U.S. Special Operations forces working alongside the SDF fighters will be particularly keen on establishing whether any key Islamic State leaders are still holed up in Baghuz, including perhaps the Islamic State’s leader, Abu Bakr al-Baghdadi. U.S. and SDF officials say, however, that they have no reason to believe he is there. They will also be hunting for evidence of the survival of any of the Islamic State’s foreign hostages who remain unaccounted for, including British journalist John Cantlie and an Italian priest, the Rev. Paolo Dall’Oglio, who was kidnapped by the Islamic State in the city of Raqqa in 2013 and has not been heard of since. This article was written by Liz Sly from The Washington Post and was legally licensed through the NewsCred publisher network. Please direct all licensing questions to legal@newscred.com. next F-35 Will Cost Less To Operate Than Older Fighters. Here's Why Some Policymakers Don't Get That.